Then Benedict watched as the apparition slowly faded. After he recovered from the sweetness and beauty of the apparition, he felt a great urgency to tell others. He ran back down the hill toward his home and met his wife on the way. But she mocked him, disbelieving, and said that he must be suffering from sunstroke. He continued running, excitedly, down the mountain path to tell the parish priest. The priest and Benedict’s neighbors were all skeptical upon hearing his story. The following day, Benedict climbed a fig tree to pick fruit, but the branch to which he was clinging snapped off, and he fell. Friends carried him home where it was learned that he had broken a number of bones and suffered severe internal injuries. Due to his serious condition, he was given the Last Sacraments or Last Rites by the priest. Now he feared that he would be unable to spread Our Lady’s request to the proper individuals. Grieving these circumstances, he promised that if the Blessed Virgin would help save his life, he would make certain that the church would be built. Blessed Mary appeared to him again and repeated her request for a church to be built at the place of her first appearance on the mountain. She scolded him for his lack of faith and indicated that his fall from the tree was punishment for allowing his wife to persuade him that his vision had only been an illusion. Our Lady stretched out her hand towards him and then vanished. When she left, he was instantly cured! When his neighbors, who knew the severity of his injuries, observed his immediate cure, they replaced their doubts and skepticism with wholehearted belief. With approval from the priest, they began collecting money for the building of a small chapel on Mount Figogna. The church became popular so quickly that it had to be extended — and by 1530 it needed to be completely replaced by a bigger church. In 1582 the shrine was visited by the Bishop of Novarra, who gave his approval for the apparitions, commended the people for their piety – and especially praised the high altar and the image of the Blessed Virgin carved on it. In 1604 a commission of inquiry into the apparitions was opened by the Archbishop of Genoa. The shrine was again authenticated and given the name Madonna della Guardia – Our Lady of the Guard-post. The Confraternity of Our Lady of the Rosary was established there in 1598. In 1614 a Company of the Glorious Virgin of Carmel was founded. Of all the miracles attributed to Our Lady of the Guard, the most famous is that which took place in 1625. Charles Emmanuel, Duke of Savoy, marched on Genoa with an army of 14,000 men. 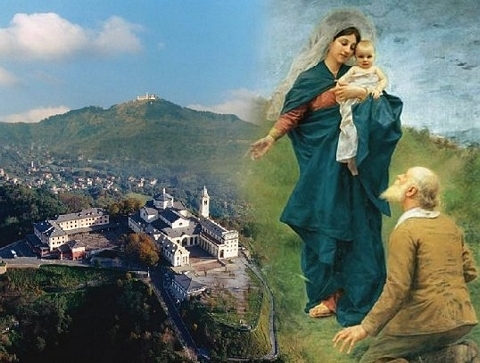 Knowing that they were outnumbered, a saintly Capuchin lay brother, Fra Tomaso da Trebbiano, urged the people to pray to Our Lady of the Guard for protection. The next day, when Charles’s huge army marched confidently towards the city, it was repulsed by a few hundred, poorly-armed, local peasants who had been sent into battle with religious fervor and the blessing of their priest. It was seen as a miracle! In gratitude, the people erected a bell tower at the shrine. On the Feast of the Assumption in 1632, a marble statue of the Blessed Virgin was set up over the high altar in the chapel that marked the location of the first apparition. 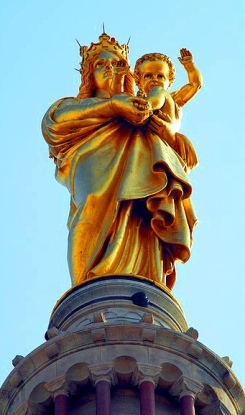 In 1654 this became the first Marian shrine to institute the ritual of the Solemn Coronation of Our Lady – a joyful celebration in which thousands of pilgrims climbed to the top of the hill, sang and prayed as the crown was placed on the head of the marble statue. Father Giuseppe stood up, and everyone saw that he was completely cured! A second statue is found on the wayside chapel of St. Pantaleon on the mountainside. A third and wooden statue is found in the church on Mount Figogna. In 1894, Pope Leo XIII commanded that a formal coronation of that statue take place. The basilica of della Guardia was built in 1923; the greatest day in its calendar is August 29 when there are colorful celebrations and torch-lit processions at night to commemorate Benedict Pareto’s original encounter. The walls of the church are inlaid with marble with the perpetually-lit, crowned, marble statue of Mary in its niche near the high altar. Six popes from Clement XVI to Benedict XVI have honored the shrine in various ways.